From its founding, a major objective of the SGC has been the improvement and maintenance of public spaces around the city. 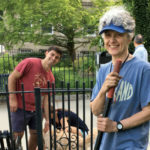 Garden Site Volunteers work in teams for as little as a few hours or longer-term, on spring and fall clean-ups, designing and planting, watering and other activities. Plants and other supplies are purchased from club dues and plant sale activities. Native Pollinator Garden, Community Bike Path at Highland Road, This 23-ft circle in full sun provides food for the larval stage and the mature insects of our native pollinators—butterflies, bees,wasps, beetles, and files. Adults may be omnivores for nectar and pollen, but caterpillars (larvae) often need particular host plants. Here are butterfly weed (the monarch butterfly), common violet (great spangled fritillary), a grass that hosts many species, and others. These essential insects keep our food chain and our New England landscape healthy. 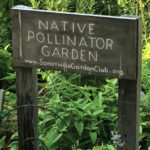 More Information About our Native Pollinator Garden. Somerville Museum Garden, 1 Westwood Rd x Center Street, The Museum garden, flanking the formal entrance, features a variety of hostas and other shade-loving perennials on one side under the shade of a great Linden tree. 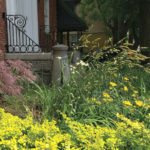 Sun loving perennials, lilies, grasses, and flowering ground covers fill the other side. This spring, we added colorful annuals and new perennials in areas cleared by recent renovations. West Branch Library, 40 College Avenue, The West Branch Library garden has been maintained by garden club members for more than 20 years. 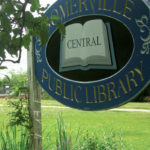 It boasts many well established trees and perennials, including a fern-leaf beech (Fagus sylvatica asplenifolia), Japanese maple, and Somerville’s only dawn redwood (Metasequoia glyptostroboides). The park-like atmosphere is a real treasure just outside bustling Davis Square. Central Branch Library, 79 Highland Avenue At the Central Branch Library, club members have planted and maintained a large sunny bed to the right of the main entrance, as well as a shadier circle around the library sign in the lawn area. There are perennials around some larger blooming shrubs (spirea, rosa rugosa, butterfly bush), and the circle has a showy display of blooming bulbs in spring. 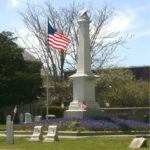 Milk Row Cemetery, 439 Somerville Avenue, This historic cemetery heralds the arrival of spring with a dazzling display of hundreds of spring bulbs planted and maintained by SGC members.